KUALA LUMPUR: Malaysia’s Asian Rail Academy (ARA) aims to spur the railway training industry by being Asia’s first authorised training partner of UK’s National Training Academy for Rail (NTAR). “It is timely to see the training demands of the industry being met for not just Malaysia, but the fact that Malaysia will be the key hub for training in Asia,” Minister of Human Resources Datuk Seri Richard Riot noted in a speech read on his behalf yesterday in Kuala Lumpur at the launch of the academy. ARA will be the first training provider in Asia to offer rail safety certification programmes from TÜV SUD Germany that are globally recognised industry-relevant certification programmes in traction, rolling stock and railway safety. The courses will also use Virtual Reality Curriculum and Safety to enhance learning and skills-another first in Asia. Present at the launch was British High Commissioner to Malaysia Vicki Treadell, Technology Depository Agency Bhd (TDA) CEO Datuk Zailani Safari, Human Resources Development Fund (HRDF) CEO Datuk CM Vignaesvaran Jeyandran, NTAR UK business development head Jennifer Walpole and ARA CEO RA Thiagaraja. 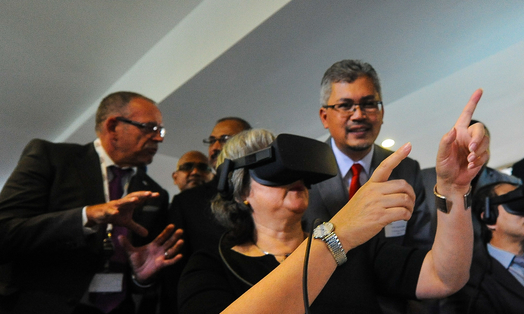 Thiagaraja told reporters the academy will be the first training facility to use Oculus Rift virtual reality in Malaysia and tracking of learners’ progress will be done through an interactive software channel. The event featured signing ceremonies between TDA and HDRF; and TDA with ARA, a kick-start to the National Rail Centre of Excellence (NRCOE). Zailani said TDA will facilitate the growth of rail industry infrastructures, undertake researches, plan and coordinate various aspects of rail-based transport to create an efficient, economical and safe transport ecosystem through the Industrial Collaboration Programme. “We are expecting more in Malaysian railway development by the initiation of the Mass Rapid Transit Line 2 (MRT2) and Light Rail Transit Line 3; East Coast Rail Link and the high-speed rail." “The establishment of NRCOE is targeted to close the gap in human capital development, the current workforce in railway is about 16,700 whereas the requirement workforce for the years 2017-2021 is 68,000 workers,” he said. “We are expecting more in Malaysian railway development by the initiation of the Mass Rapid Transit Line 2 (MRT2) and Light Rail Transit Line 3; East Coast Rail Link and the high-speed rail, expected to begin in late 2017, 2018 and 2019 respectively,” he said. He added that the collaboration between TDA and ARA will focus on three main programmes — the NTAR Traction and Rolling Stock Programme, NTAR Leadership and Management Programme and TÜV SÜD Railway Safety Programme. The courses at the academy will start at RM5,000 and the first class will be held in September 2017, with 100 participants signing up, largely from Mass Rapid Transit Corp Sdn Bhd. The academy targets to train 16,000 students by 2022 and is situated in Wisma Goshen, Bangsar Trade Centre, Kuala Lumpur.